Motherwort was a popular medicinal herb for many centuries, used to cure things from menstrual cramps to heart conditions. Discover its benefits. Motherwort is native to central Asia and parts of Europe and has been naturalized in North America. Historical information about motherwort shows that it was traditionally used to treat nervous heart conditions, relieve menopause symptoms, and calm women during childbirth. Some of these applications have been corroborated by modern medicine. Relieving menstrual cramps. 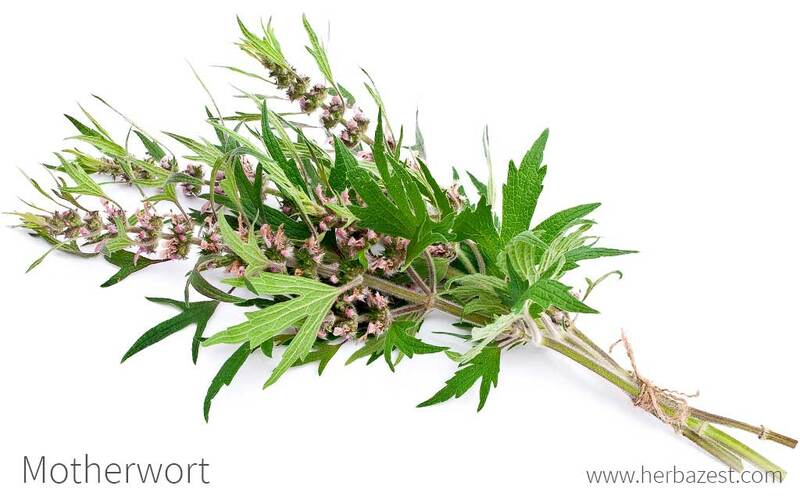 The antispasmodic properties of motherwort have been traditionally used to relief of premenstrual syndrome (PMS). Treating cardiovascular conditions. Motherworth has shown cardioprotective properties, and it is used for lowering blood pressure, as well as for stabilizing heartbeat. In addition, depending on the dose, motherworth can also stimulate muscle contractions, and it can be used for encouraging menstruation in the case of amenorrhea. Treating nervous conditions. Soothing and anti-inflammatory properties are attributed to motherworth, which has been traditionally used for alleviating depression and menopause symptoms related to anxiety. Managing thyroid hyperactivity. It is believed that motherworth can regulate the activity of the endocrine system, thus improving the symptoms of hyperthyroidism. The main compounds behind motherwort's health properties are alkaloids, mainly stachydrine and leonurine. The latter seems responsible for its antioxidant properties, and new studies also suggest it could prevent tissue death following a heart failure. Other significant compounds include iridoid glycosides, flavonoids, phenolic acids, and tannins. Both leonurine and stachydrine have uterotropic properties, and this underpins motherwort's reputation as a uterine tonic. Test tube studies suggest that small concentrations of leonurine induce uterine contractions, but larger concentrations actually inhibited uterine activity. This could explain why motherwort's medicinal uses have included both oxytocic and antispasmodic applications, having been used to expel things from the uterus and also for relieving menstrual cramps. Motherwort health benefits can also be attributed to the plant's iridoid glycosides, as they inhibit the formation of prostaglandins, which induce inflammation and activate the pain response. This explains the popularity of motherwort for calming menstrual cramps. Herbs that help with premenstrual symptoms and menopause are alfalfa, anise, and flax, whereas garlic, grape vine, and lucuma also provide cardioprotective benefits. This herb is mostly regarded as safe for consumption and does not interact with any medication in any serious way that is known within the scientific community. However, if taken in sufficient amounts, motherwort can cause diarrhea and uterine bleeding, as well as nausea. Motherwort was once used for calming women during childbirth; however, its consumption during pregnancy is not advised, since it can cause uterine contractions, which can lead to early labor or miscarriage. Because it has emmenagogue properties, motherwort should not be used for menstrual cramps if the bleeding is too heavy. Motherwort is mostly used in medicinal ways; however, the cooked young shoots of the plant have a rather sweet taste. Motherwort honey is eaten to promote heart health. Infusion. Motherwort tea can be brewed from the dried leaves and flowers, and taken for soothing menstrual cramps and menopause symptoms, as well as for normalizing irregular heartbeats and blood pressure. Liquid extract. Distillated from the upper parts of motherwort, this preparation can be diluted in a glass of water and taken to stimulate the endocrine system, as well as for cardiovascular support. Cream. Water-based and easily absorbed, motherwort cream can be applied as a nerve soother for the relieve of menstrual cramps and other uterine complaints. Capsules. This supplemental form delivers all the medicinal properties of the herb in fixed, daily doses. Motherwort capsules are mostly used for relieving symptoms associated with premenstrual syndrome (PMS) and menopause. Fresh motherwort can usually be found wild in woodland areas or on roadsides. Alternatively, it can be cultivated in gardens. It is also possible to buy motherwort pre-dried, and this can be used in cooking or to make homemade medicinal remedies. Motherwort tea is available in health stores and can also be purchased from online retailers. Sold in the form of capsules, liquid extracts, and creams, motherwort is a popular herb for cardiovascular support and also for dealing with gynecological complaints. Medicinal preparations and supplements can be easily found at specialized herbal stores and a wide variety of brands is available through online retailers. Motherwort can be found in the wild, growing naturally along stream beds. This is a hardy plant that can thrive in most climates and soil conditions. However, some basic requirements need to be met in order to cultivate this beautiful and medicinal herb in a home garden. In countries with temperate climates, motherwort cultivation is possible during the summer months. This easy-to-grow plant will germinate with temperatures of approximately 70°F (20°C). Motherwort prefers moist soils and shady conditions. The loss of soil moisture reduces overall vigor. This plant can be propagated from both seeds and rhizomes. If planted in May, the scented purple flowers, beloved by bees, will appear in the second half of the summer. This plant is self-seeding and tends to be invasive, so cutting flowers when they fade is the best way to keep it under control. Regular mowing reduces the overall vigor of the plant, helping restrict uncontrolled spread. Motherwort plants reach an average of five feet (1.5 m) tall and feature distinctive toothed, drooping leaves and small, pink flowers arranged in axillary clusters on elongated flowering branches. In Traditional Chinese Medicine, motherwort leaves are called yìmǔcǎo (益母草). Motherwort (Leonorus cardiaca) is a member of the Lamiaceae family, which contains about 7,200 species of flowering plants spread out across 236 genera. This botanical group is often referred to as the mint or deadnettle family, and it contains many economically-important herbs, such as lemon balm (Melissa officinalis), oregano (Origanum vulgare), sage (Salvia officinalis), rosemary (Rosmarinus officinalis), peppermint (Mentha piperita), and basil (Ocimum basilicum). The genus name of motherwort, Leonorus comes from the Greek leon, meaning lion, and oura, meaning tail in reference to the inflorescence. Botanists have agreed to divide L. cardiaca into two distinct subspecies, L. cardiaca subsp. cardiaca and L. cardiaca subsp. villosus. L. cardiaca subsp. cardiaca also possesses two agreed-upon varieties, pubescens and royleana. Finally, it is worth noting that there are two other well-known herbs that are also known as "motherwort," although they belong to different species: Chinese motherwort (Leonurus heterophyllus) and Siberian motherwort (Leonurus sibiricus). Both species seem to share the same uses as common motherwort. The medicinal uses of motherwort can be traced back to the early Greeks, who gave the herb to pregnant women suffering from anxiety. Because of this particular use, the herb was called "mother's herb." In Europe, motherwort was used primarily for treating cattle diseases, and it was introduced to North America by the first settlers. During the 19th century, motherwort was highly valued for its ability to stimulate uterine contractions, and it was prescribed to promote menstruation, as well as for aiding afterbirth expelling. However, the Cherokees used the herb as a sedative, for treating nervous conditions. Besides some references from 16th century herbalists, the cardioprotective properties of motherwort were generally overlooked until recently. In the Victorian Language of Flowers, motherwort symbolizes concealed love. The ancient Chinese believed that motherwort promoted longevity. According to a legend, a young man who committed a minor crime was banished from his village to a remote valley surrounded by motherwort, where he lived to be 300 years old. As there is no motherwort market to speak of, the plant has little economic importance across the globe. There is a niche for the herb in the herbal medicine industry, but outside this, there is not a lot of demand for motherwort products. Dye. A dark green dye can be obtained from the leaves of motherwort. Gardening. Because of its unassuming, yet beautiful pink to purple flowers, which attract pollinators, as well as for its clumping habit, motherwort is appreciated for some gardeners.